As of today, MarineLife Keyword List has been updated to version 2.0, which contains many marine species additions from the tropical Pacific. 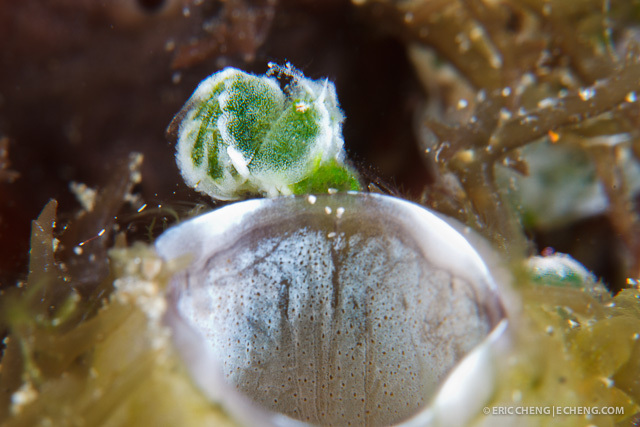 For example, this little critter, which is sometimes referred to as the “little green shrimp” is now identified as a Phycocaris sp. algae shrimp. Customers who purchased MarineLife Keywords on April 27, 2012 or later are entitled to a complimentary upgrade by contacting us and sending us your email purchase receipt. If you purchased before April 27, 2012, you can upgrade to v2.0 by purchasing the Tropical Pacific Fishes and Tropical Pacific Invertebrates Pack for $9.99. Customers who purchased the full list after July 26, 2012 do not need to upgrade—your keyword list is complete. February 20, 2013 by Eric Cheng. We have just updated MarineLife Keyword list to version 1.1. The update included minor keyword list refinement and additions. In particular, we fixed a small list of typos and added a significant number of Caribbean sea slugs. The new list has replaced the old list on our servers, so if you purchase the list now you will get the new one. Those of you who want to upgrade can just import the new list over your old list. Note that this will result in duplicate keywords in cases where a typo was fixed. So if we had a keyword called “tpyo” and we changed it to “typo”, your list will contain both after the re-import. One way to remove the old keywords is to remove all keywords before importing the new keyword list, but this would also remove keywords attached to your images, so only do this if you know what you are doing. Barry Guimbellot’s informative video tour about how to use MarineLife Keyword List with Lightroom.